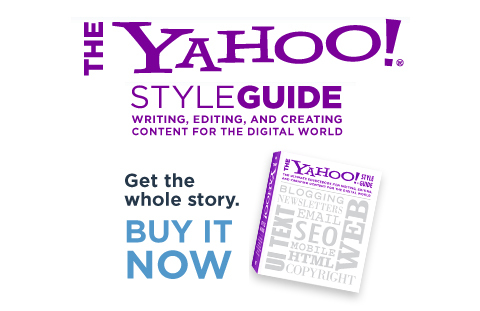 Yahoo is taking upon itself the responsibility to bring solutions to all our digital publishing queries and problems as it has announced the launching of “The Yahoo! Style Guide: The Ultimate Sourcebook for Writing, Editing, and Creating Content for the Digital World”, on July 6 by St. Martin’s Griffin. It will not only be available in print but also in digital form for the iPad and Amazon’s Kindle for $21.99, but you can get it online at $14.84. Divided in to six sections, the guide aims to focus on the online grammar and punctuation usage and presents its version of popular web based terms such as ‘Email’ instead of AP Style Book’s ‘E-mail’ and ‘smartphone’ instead of the former’s ‘smart phone’. The guide is targeted towards a wide audience including professional journalists, bloggers, technical writers, editors, web developers, designers, small- and medium-size businesses, advertisers and PR agencies. It promises to provide extensive practical advice and tips for writing for the web, articles about issues like how to appeal to an online audience, making your site accessible to those with disabilities, search engine optimization, creating content for mobile devices and what makes a strong headline.